We (Ije and Samia) are both Radical Entrepreneurs so we understand the gifts and challenges of this journey, personally and through the lens of hundreds of our members (our Turtles), partners and clients. For years now, we’ve been developing a radical strategic framework that we call Strategic Being (rooted in the natural art/science of creation) to support Radical Entrepreneurs like ourselves. Why? Because when we first started doing this work, there was really nothing out there that supported how we are each uniquely designed to work and what we are each uniquely here to do. We thought that being Radical Entrepreneurs meant that we were free. We were our own bosses, that we could run our own lives, our schedules, our lifestyles. Have real widespread impact without compromising our values. Create radical jobs and innovative offerings that addressed systemic issues. Redesign an unjust economic system! We were on it! Not. Here’s what really happened. We drove ourselves into the ground. We were depleted, stressed, overworked. Our bodies were in constant chronic flares and our mental health, well, was unfortunately getting worse than before we started. And all that for very little return or impact. It was painful -- to say the least. We’ve both been through the devastating truth of what it means to be a queer, person of color trying to be a Radical Entrepreneur in a world that is designed for us to fail. A world that wants to drive us to our end, especially if we’re not willing to participate in our own oppression and be “well-behaved” workers. So after getting on and off the Radical Entrepreneurship trail a number of times, we realized a big truth. The reason we weren’t successful is because we were re-creating the work style of a system that is designed to oppress us. Of course, things got worse for us, not better. So we started to think about how we could design a way of working that uplifted our whole selves. A way rooted in Radical Love and Freedom, in practice. We wanted to work FROM love and freedom, not simply FOR love and freedom. We designed a strategic framework rooted in nature, in our body’s wisdom, in the wisdom of afro-indigenous approaches and queer, people of color strategies for thriving. We did it for us first and then started to share it with our communities. The first thing we teach in our strategic framework is (you guessed it): The Radical Purpose Framework, Tool AND PRACTICE! Why The Radical Purpose for Radical Entrepreneurs? We define a Radical Enterprise as a “system of wholistic radical relationships”. A Radical Enterprise is sustained through good relationships to: ourselves, our partners/teams, our stakeholders and communities. Without those relationships, we have no enterprise. Aligning with our Radical Purpose is what keeps the relationships in our system balanced and potent. It is what makes our Radical Enterprises the most impactful organizations they can be. The Radical Purpose (re)aligns us with our unique purpose, sets us up to root in desire, work how we’re best designed to operate, take care of ourselves and make the most effective strategic moves! As people of color, particularly women or those of us with feminized upbringings, we will take care of everyone but ourselves. We put our well-being at risk and we sacrifice the gifts we’re here to share with the world. In not putting ourselves first, we end up out of alignment with our Radical Purpose. We often erase ourselves in the process of creating our enterprises -- it happens to the best of us (and it happened to us, Ije and Samia). In fact, we’re always at risk of that through our conditioning and we have to keep ourselves in check. Even though putting our work, our families, our clients and teams first can look like a noble act of service and self-sacrifice in the name of supporting the whole... it’s actually doing us, our enterprise (and everyone else) a massive disservice. Why? We never have enough time, energy, space, money, resources, people. We think that paying ourselves what we actually need means we’re robbing others of their resources. We underprice and overwork -- never getting what we deserve and feeling undervalued. We draw people to us that will feed off of our guilt and shame. When we’re not in tune with ourselves, we lose access to our Radical Purpose, our innate creative power, our reason for being alive. We are not aligned with our most potent desires and we waste the unique gifts that we’re here to share with the world. Equally, our most precious innate strategic sense is dulled and not accessible. Our decision-making center is clogged and we tend to make reactive decisions that have no defined strategy. Desire fuels the fire of sustainability. Without it, without love and a strong, deep connection to our work (not just our goals and outcomes but our process), we won’t stand a chance. Desire is what allows our enterprise to survive and thrive through the challenges that only get more challenging! The Radical Purpose Tool engages us in a consistent practice of (re)aligning with our reason for being which is our place of greatest power. It insures that we’re operating from a place of fullness to draw in more fullness, that we are in tune with our strategic center to make the best proactive decisions and that we’re desire-driven so we can thrive long-term. The Radical Purpose tool connects us with a strategic practice that is aligned with our core power. From that place, we can come up with strategies that are magnetic, potent and impactful. The Radical Purpose (re)organizes the relationships within our Radical Enterprise (our partners and team members) towards optimum operational fit and supports us in creating harmonious systems that don’t overextend us with responsibility so we can do our most important work! Entrepreneurs come to us often because they’re bogged down with over-responsibility. Their teams and enterprises are overly dependent on them (some would say co-dependent). They can’t seem to have space, time or energy for anything but putting out fires and taking care of the day-to-day of their enterprise. They can’t seem to plug out of the machine, so to speak, and transform or create anything different. Their leadership and facilitation skills are underdeveloped, challenged and questioned. They’re seeking better systems to run their teams and operations. After years of doing this work, we know that 80% of an enterprises’ systems challenges start at the foundation in the following area: a misalignment of Radical Purposes (followed by a mismatch in people facilitation styles… but we’ll hold on that for a moment). Having a tool and practice where we can understand and consistently re-evaluate or refine everyone’s Radical Purpose (ours included) and the Radical Purpose of our enterprise is what creates the ecosystem where the most harmonious relationships can flourish. It is the place from which the most effective systems can emerge, organically and seamlessly. The Radical Purpose tool is what we apply to organize our partners and teams into the most potent combinations for greatest impact. Well you can guess by now how the Radical Purpose tool is pulling everything together… like GRAVITY. We call Radical Purpose: our natural center of gravity. A Radical Enterprise is made of up (and thrives on) communities that gather around the enterprise’s Radical Purpose. Without our communities, we have no enterprises. Once we (ourselves, our partners and teams) are in the practice of (re)aligning with our Radical Purposes, our Radical Enterprises are inherently operating from a place of deep Radical Purpose. We start to collectively co-create with the natural mystery, within the natural art/science of creation. We innovate beyond the imaginable. Our Radical Enterprises become magnetic. With the Radical Purpose framework, we create enterprise models and offerings that are incredibly attractive, life-changing and sustainable long-term. We draw the most aligned stakeholders (who bring in more of their communities). We challenge the status quo without sacrificing our well-being or our gifts. We engage seamlessly in the larger marketplace and create spaces made of new realities. 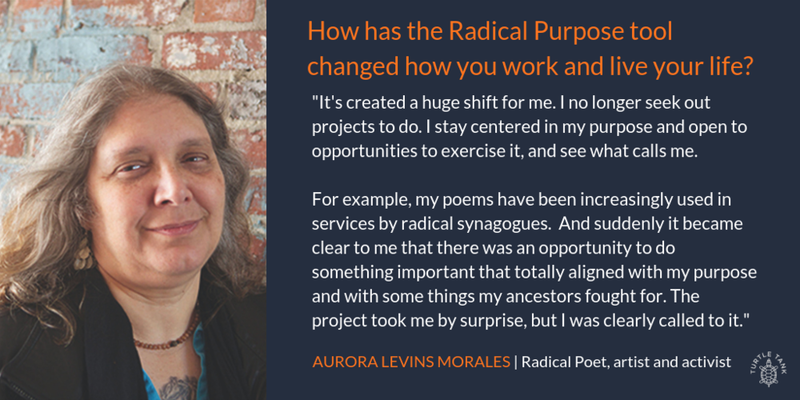 Most importantly, we organize our communities around Radical Purpose to create worlds of Radical Love and Freedom. By submitting the payment form, you are agreeing to be charged once we send you the acceptance notice via email OR if you never submit your application. Your first charge of $300 will be automatically deducted 48hours from the time you entered your payment information. Your second charge of $300 will be deducted 30 days from the time the first charge was made.